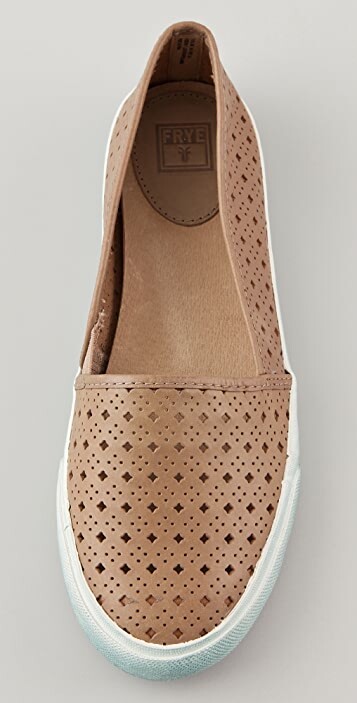 These slip-on leather flats feature a laser-cut pattern and a dirtied, textured rubber sidewall. Padded footbed and rubber sole. I was looking for a good closed-toe shoe that I can throw on when running errands, stepping outside, or the like. This shoe fits the bill. I thought it to be slightly loose, but it works for me, as my feet tend to get a bit swollen as the day progresses. Though comfy, these shoes are not at all flattering for wide feet due to the absence of arch support. I'm unfortunately returning them for that reason. These were standard sizing in length but if you have high feet the are a tight cut across the band that goes over your feet. Perfect quality as always from Frye. Very cute. I am a size 41 with wide feet. Length is as expected, am keeping them and hoping they stretch. 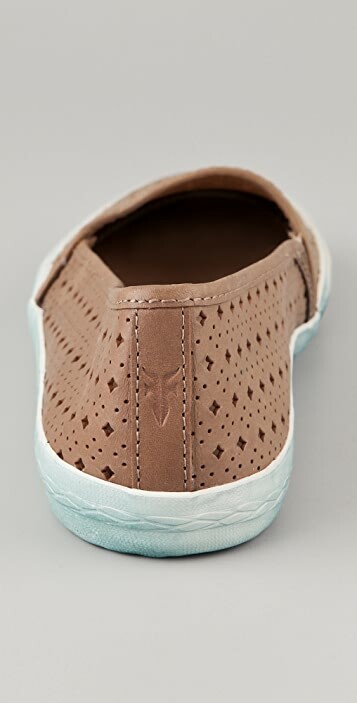 Alternative to ballerinas, so comfortable and provide effortless look.